So there you are driving down the street in Huddersfield, minding your own business on your way to work. You approach a stop sign, slow down, and stop when all of a sudden someone runs into your vehicle. Now you’re going to be late for work after exchanging insurance information, assessing damage, swapping contact info, etc. Now you’re in a bad mood because your car looks beat up and you’ll have to take the day off work to sit in a garage while your vehicle is fixed, and possibly pay an arm and a leg to get it repaired… right? Fortunately not! Car Cosmetics is proud to announce their mobile service area in Huddersfield! 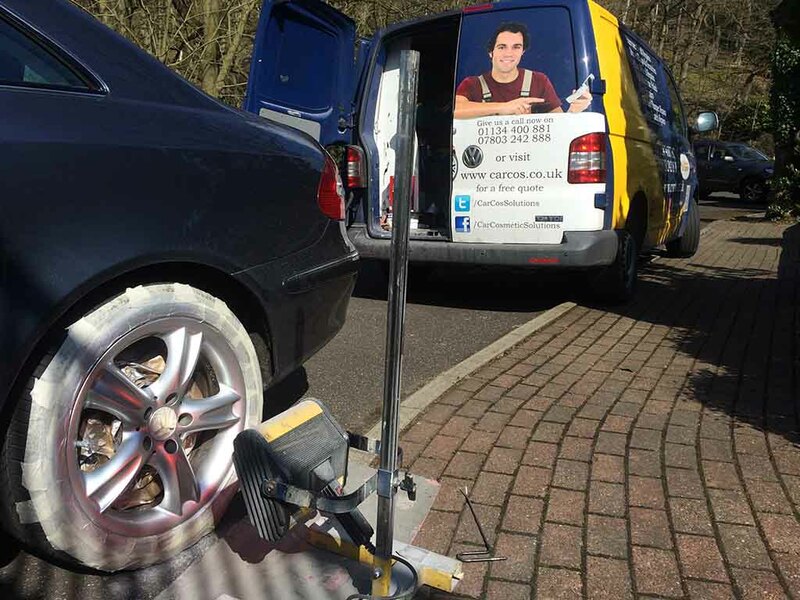 This means whether you live or work in Huddersfield, we can come to you and perform a wide range of services so you don’t have to go out of your way to get your vehicle fixed up. In most cases we can offer same-day service and are always available to provide a free quote – we’ll even get back to you within 24 hours! You’ll be sure to find we’re one of the most competitively priced providers of car body repairs in Huddersfield with the unmatched convenience of personal mobile service. repair specialists are highly trained auto repairmen and we are under continuous education to keep our methods and techniques at the cutting edge of the auto body repair industry. This allows us to stay ahead of the competition while offering you the best repairs available. Maybe you clipped your wing mirror against a wall while backing out of your garage the other day and a piece of the mirror housing came off? We can easily repair the damage and get it back to it’s former glory. Some of the repairs we offer aren’t strictly aesthetic, either! Having a fully functional set of wing mirrors is essential to safe driving. Having your ability to see behind you and to the sides of your vehicle is crucial to proper driving and allows a driver to make more informed decisions about changing lanes and so on; Car Cosmetics can help get your vehicle back in top shape so you can be a safe driver again. Other services we offer can help protect your paint while making your vehicle stand out. Our showroom machine polishing services, while primarily sought after for the visual appeal of having a nice shiny car, actually serves to protect the paint as well. While the polish protects your clear coat, the clear coat is protecting your paint which in turn protects your panels. Unprotected metallic panels such as your bonnet or boot will quickly rust when exposed to the various elements, especially in rainy hills of Huddersfield. Rust can quickly and easily spread around to all of the other nearby metal panels causing your paint to bubble up and chip off. If you take preventative measures throughout ownership of your vehicle by polishing it, you can prevent rust damage entirely. This also goes for having scratches repaired; any damage to your vehicle that can expose underlying materials can lead to more harm down the line. Call Car Cosmetics today for car body repairs in Huddersfield or request a free quote here. We’ll get back to you as soon as possible and we can schedule an appointment for when we can bring our mobile repair shop to your vehicle, assess the damage, and fix it up for you – all while you relax at home or are busy at work. Fill out the form below for any type of car body repairs in Huddersfield.